The Motley Fool Canada » Bank Stocks » Which of These 2 Canadian Mid-Cap Banks Is the Timelier Investment Right Now? Which of These 2 Canadian Mid-Cap Banks Is the Timelier Investment Right Now? When it comes to the Canadian banks, it’s usually the bigger players that get most of the attention, which probably makes sense. After all, the “Big Five,” or sometimes even “Big Six” Canadian banks, as they are often referred to, are some of the largest financial institutions in the world, and together account for the lion’s share of the market for Canadian financial services. But sometimes it pays (literally) to do a deeper dive to see if there aren’t any better opportunities out there, at least for those willing to roll up their sleeves and do the hard work. In this respect, some of Canada’s smaller lenders can offer interesting risk/return trade-offs from time to time. Two of those smaller lenders we’ll focus on are Laurentian Bank of Canada (TSX:LB) and Canadian Western Bank (TSX:CWB). Laurentian Bank is the smaller of the two, with a market capitalization of $1.85 billion as of this writing. Canadian Western Bank, or simply “CWB,” is slightly larger at $2.63 billion but still well below the likes of Bank of Nova Scotia or even National Bank of Canada, which is sometimes considered as the smallest bank of the Big Six. CWB has, for most of its existence, been concentrated in the western half of Canada with a significant exposure to Alberta and the Canadian energy markets. In recent years, CWB has made several large acquisitions that it hopes will help to diversify its portfolio from being so heavily concentrated in Alberta, but those moves will still take some time to play out; until then, this would still have to be considered as Canada’s most regional western bank. Laurentian Bank is more concentrated in Canada’s eastern markets, namely its home Quebec market as well as a sizable presence in the Atlantic provinces. Like CWB, Laurentian Bank has been busy in recent years growing its book of business, including the acquisition of some larger commercial and equipment finance companies that it hopes will help to broaden its product offerings while also providing an entry into the U.S. market. I happen to be optimistic on the outlook for both of these Canadian mid-cap banks, and, frankly, a lot of that is tied to the fact that despite recent the recent spurt of growth that both have enjoyed, both remain quite small relative to the rest of the market, which tells me that both have the potential to continue on their current growth trajectories for some time. But which makes the timelier play at this moment in time? For me. it seems like Laurentian Bank is the right way to go. Granted, shares in both companies have experienced strong run-ups as of late. CWB stock is up 13.6% so far in January, while Laurentian Bank shares are up 15.8% in January. But when we take a look at the performance of shares in both companies longer term, it looks as though CWB might have some gains to give back to the market. The graph above shows that over the past three years, CWB shares have outpaced those of Laurentian Bank by a 37% margin. Meanwhile, a review of the one-year and five-year graphs for these two companies reveals that — historically, at least — they haven’t tended to veer to far from one another for significant periods of time. 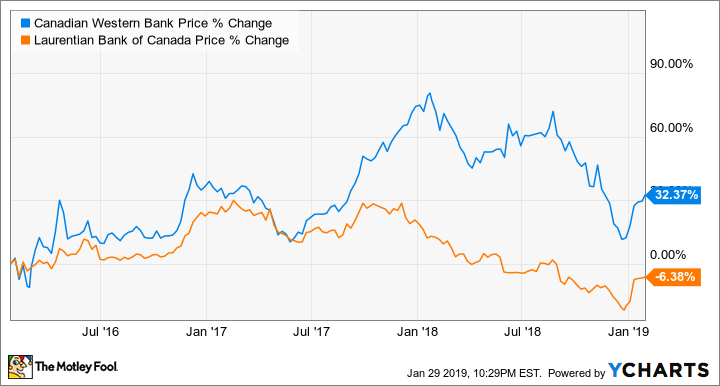 Long term, there are lots of reason to like both of these smaller Canadian lenders. Shorter term, I might want to wait for a pullback, as both companies are already up double digits so far in January. But if I were going to choose one for my portfolio right now, I’d be going with Laurentian Bank for the aforementioned reasons. Fool contributor Jason Phillips has no position in any of the stocks mentioned. Bank of Nova Scotia is a recommendation of Stock Advisor Canada.